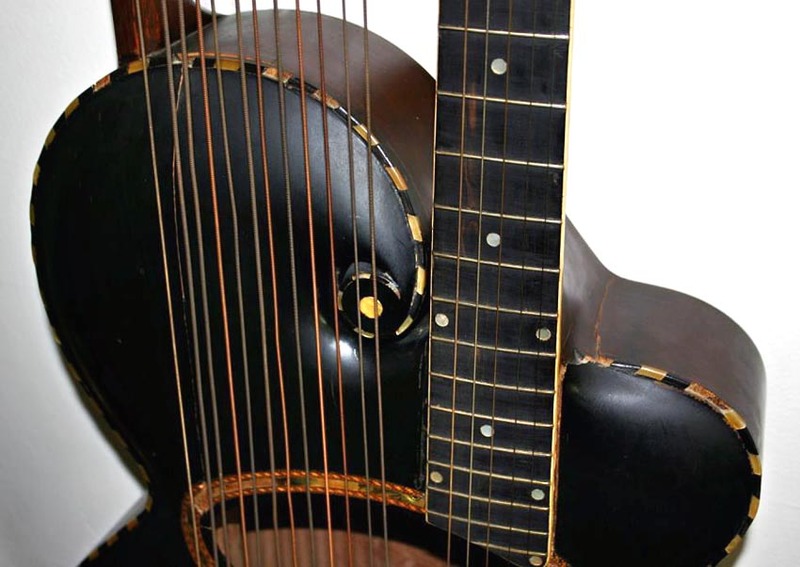 This stunning instrument - with a 21" wide body, 27-1/2" scale, ornate soundhole decoration and rope binding - has caused a bit of a stir among us Gibson fanatics. 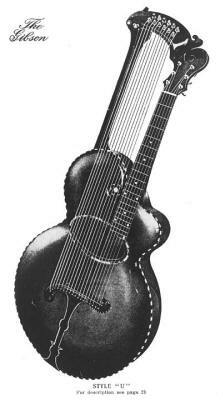 It seems that it is - as far as we are able to determine - the oldest surviving Gibson harp guitar known. And it has the lowest known serial number of any Gibson instrument of any kind. Please join me as I present the findings of Gibson expert Benoît Meulle-Stef, who analyzed the photos graciously donated by Chris Wilhelm, a friend of the instrument's current owner. For aiding us in brainstorming on the serial number and dating issues, thanks also to Dan Beimborn (head of the indispensable Mandolin Archive) and Gibson expert Roger Siminoff. While the present instrument is a fascinating and very important historical piece, it still doesn't appear to be the very first specimen, unfortunately....but close! The illustration shown (at left) in the 1902/1903 catalog (consensus is that it was produced right around the year's transition) must be considered the original model - though it may be that it actually represents a "pre-production" model. Was it, in fact, ever built? Yes - though so far, there seems to be only one known piece of providence: a beautiful photo submitted by Michael Wright that clearly shows this specimen "in the flesh." 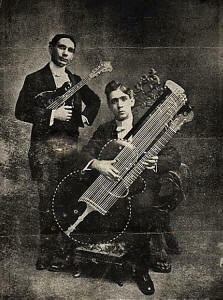 This incredible photo (at right) is the only known image of an actual specimen of the 12-bass Style U as it was shown in the 1902/1903 catalog. 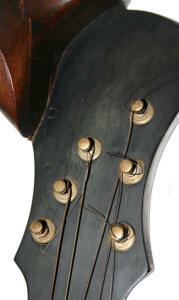 Note the scroll-in-relief and friction tuners on the main headstock and the bass tuners in 2 x 6 arrangement. We believe this is probably an un-serialized, pre-factory instrument, and one of a very few of this particular example ever made (perhaps even as few as one?!). Dan concurs, thinking that the "very first catalog was a factory demo; very few, if any, of those instruments were likely made." The extant specimen is very similar to the catalog instrument. Only the headstocks differ – the bass tuners being in a 3 x 4 arrangement and the main headstock having (originally) geared tuners and no scroll relief. 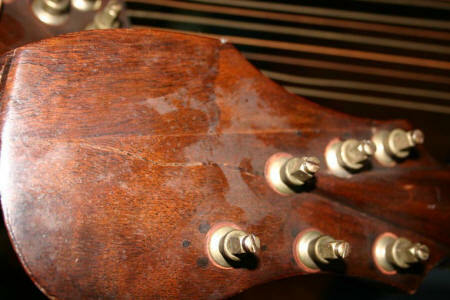 Unfortunately, the headstock was cracked and has had extensive repair. The family story points to the damage occurring in the Great San Francisco Earthquake of 1906; however, without examining it in person, it is difficult to say whether it was restored more than once. Though we can't be certain that additional, later repairs didn't occur, we believe that we are indeed looking at the original (and last) repairs that followed the earthquake. 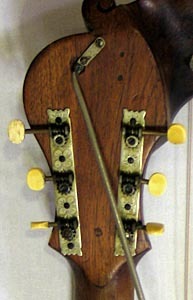 Analysing it today, we believe that it originally had geared tuners, rather than the banjo-style friction tuners as seen in the photograph above. This, along with the new 3 x 4 bass tuner configuration (which seems to have been standard from this point onward) appear to be the first (and immediate) changes to the design of the instrument shown in the 1902/1903 catalog. Despite the changes, we believe this instrument to be from the same basic time frame - specifically, right at the end of 1902 or beginning of 1903, soon after the formation of the company. Besides the similarities to the catalog, our main evidence is the serial number: 2502. From all the years of serial number collection (and specifically, Dan's recent dedicated efforts at the Mandolin Archives), it appears that this is the lowest Gibson serial number known. 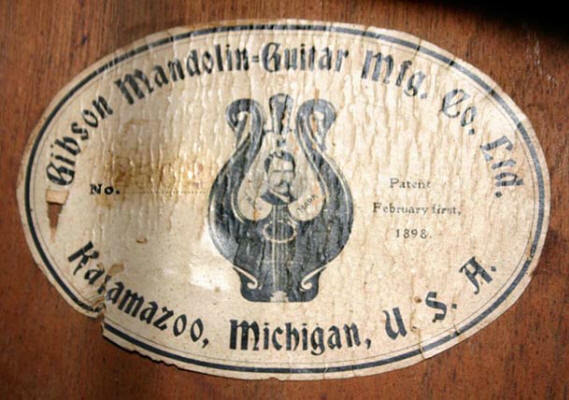 Both Dan and Roger Siminoff believe that #2500 was the likely start of the company’s serial number series – possibly coinciding with the October 10, 1902 start of the new "Gibson Mandolin-Guitar Manufacturing Co., Limited" (or soon after; certainly before 1904). 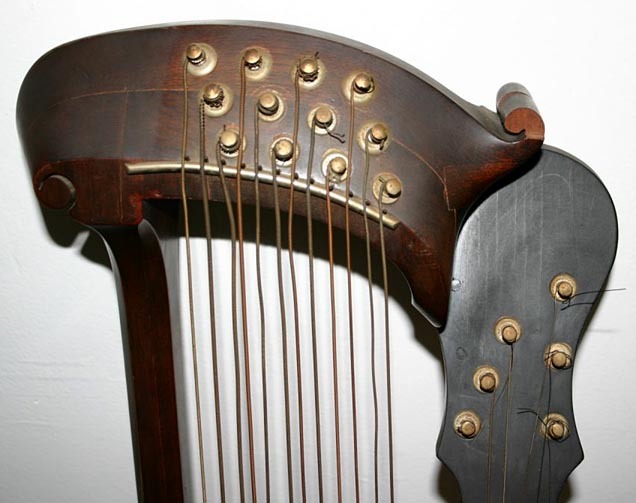 Dating the instrument by the features proved more problematic - especially when trying to extrapolate what would have been the original features of the main headstock. In this cryptic photo (left) one can still see the marks of the original geared tuners (Gibson used geared tuners without a press bushing for quite a long time - as seen in the center photo specimen). The question is: what was on the front of the headstock originally? The relief scroll shown in the catalog? The classic early crescent and star pearl inlay? Benoît is convinced that we are looking at the original geared tuner marks on the face veneer - which would thus have to be original. This would mean two things. 1. The veneer wood would have had to have been saved - retouched or repaired - while the cracked or otherwise damaged wood behind was replaced. 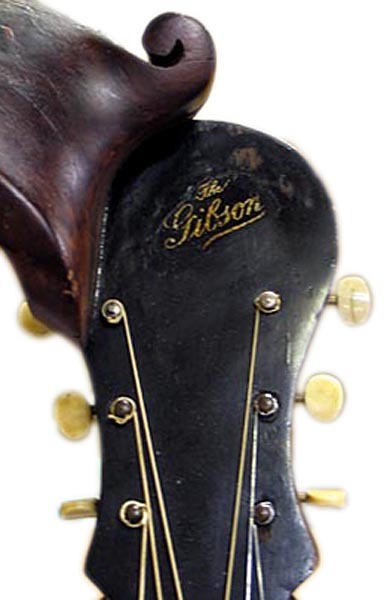 And 2) The headstock originally had neither of the early options - it would have had either a blank headstock or a silkscreen “The Gibson” logo (as seen in the center example). 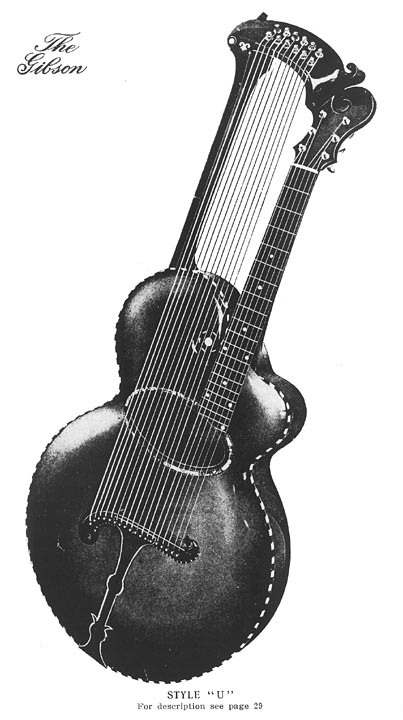 Dan Beimborn isn't convinced that the silk-screen logo would have appeared on such an early Gibson instrument (he gives serial range for them as approximately 4500-7500) - though shown is one on harp guitar serial # 3250 (1904-1905). Note how the D-string tuner is directly against the bass headstock in both instruments. 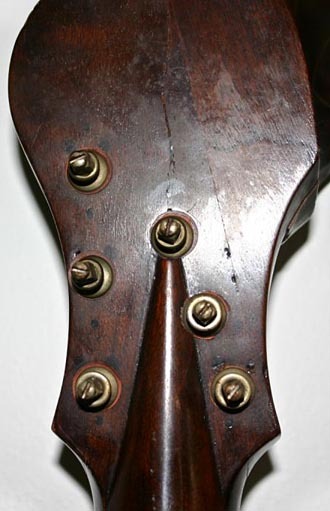 In this photo one can see marks from the original geared tuners on both sides of the neck. The black markings are indents from the machined parts that hold the gears in place. They were likely those with the longer shaft for the top tuners as shown in specimen #3250 at right, but could also have been standard tuners turned upside down (as was later done), or even something else again. 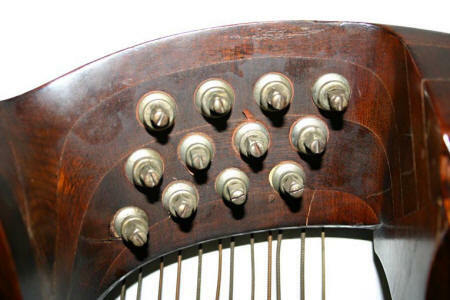 It should be noted that friction tuners would have been the only other option for this instrument, not the replacement clock-key sub-bass tuners that were perhaps obtained from Gibson after the 1906 earthquake. In this photo one can see the marks from the previous tuners (the three black marks in front of the G tuner and two in front of the B tuner). The wood repair where the headstock was rebuilt is also easily visible. The twelve sub-bass tuners all appear to be original. The extra little "horn" on the bass headstock (seen in the catalog image and all other specimens) was apparently broken off. Ah...now the back! It appears to be very close to Orville’s own construction style; i.e. a flat middle and double curve carving around the edge. Not surprising, as Orville would have still been consulting for the company when this was built. It's amazing when we find an early Gibson harp guitar with a solid, single-piece back. 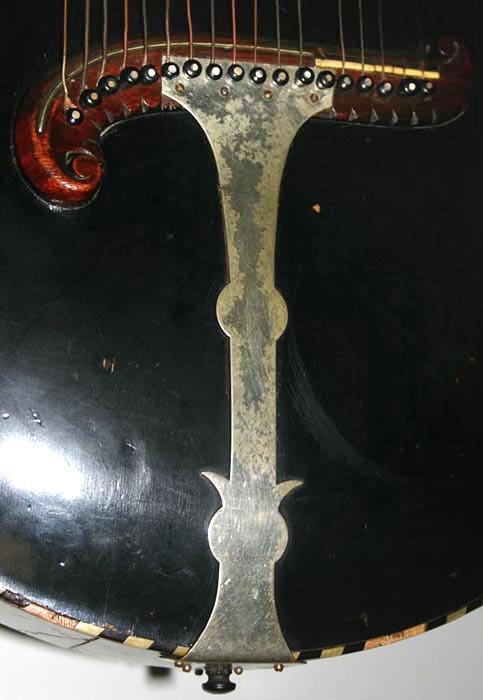 This instrument goes a step or two further; the back and sides are carved from a single log! We even wondered if the whole thing - back, sides and neck - were out of one giant piece of mahogany like many of Orville's original instruments. Without inspecting the actual instrument, it is impossible to say - but judging from this photo, Benoît and I believe there is a separate neck. In the close-up at right, I note (with the arrow) a very faint line that appears to be the seam. Other features: The present specimen has the same fancy soundhole trim (abalone) and rope binding shown in the catalog. 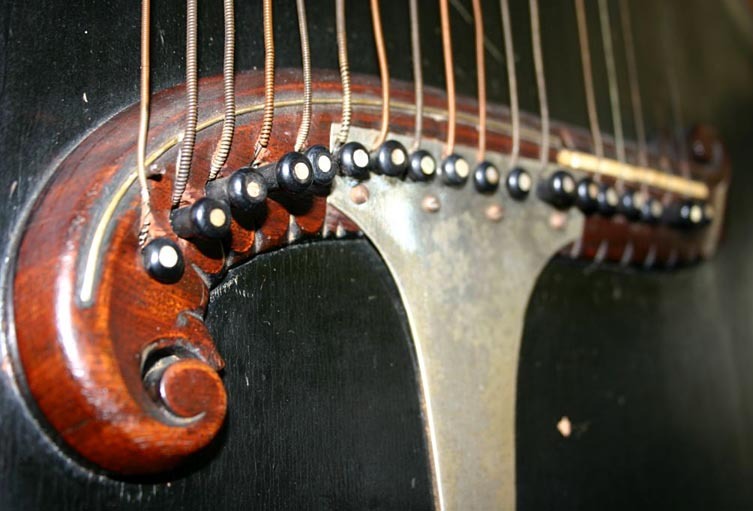 It also has the plain dot markers, which would soon give way to a fancier fingerboard inlay found on the majority of 1904-1907 harp guitar specimens. At right, one can clearly see that the neck-to-body joint is rounded instead of square - a feature that didn't last very long. Another detail that didn’t last long were the fancy engravings on the lower edge of the bridge (left). There is no “The Gibson” logo engraved on the reinforcement metal plate (right). This side view shows the unusual extra wood under the head/neck junction, which could be a holdover from Orville's designs. 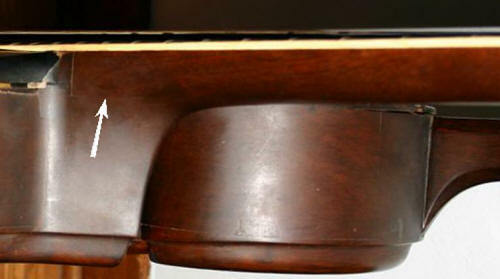 The "sandwich" bass head construction is typical of all periods. The instrument has the standard catalog measurements of a 21" wide body and extra-long scale of 27-1/2". 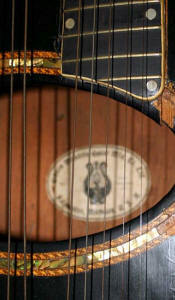 Another distinctive feature of the very earliest specimens is the unusually wide soundhole. Shown roughly to scale are #2502 and #3250. Provenance: The instrument was originally purchased by one Mr. Phillips, conductor of the San Francisco Symphony, where, in April, 1906, it suffered damage caused by the Great Earthquake. It was subsequently sold to the current owner's grandmother (Muriel Davis), probably around 1910 when she married and moved to San Diego. 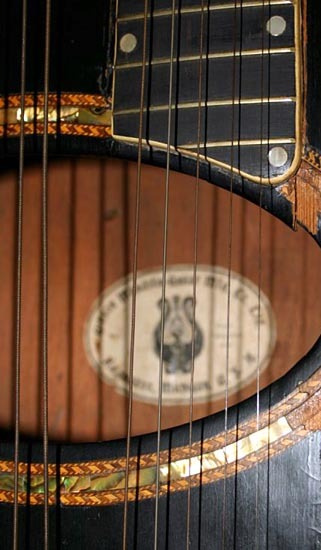 The guitar remained there until about 1970 when the family relocated to Ketchikan, Alaska - where it was stored in an attic closet until very recently when the owner happened to mention it to Chris Wilhelm, her daughter's guitar teacher and supporter of Harpguitars.net. Special thanks to Chris Wilhelm for photographing the instrument for us. All photos of #2502 copyright Chris Wilhelm.